June has treated us to an extended spell of warm weather and, dare we say it, sunshine! It's been the perfect weather for enjoying an icy-cold pint of Frontier at the events we're excited abut in July. Take a look at some of the events we'll be appearing at in the coming month. This month's installment of the Foodies Festival takes us to Circus Field, Blackheath. We'll be bringing the Frontier container bar south of the river to pair Frontier Lager with a range of delicious food. Nominated as Best Family Friendly Festival in the UK, Cornbury Festival is lining up for a final swan song. We'll be proudly supporting the festival as it bows out in style..
We'll be joining 2,000 festival goers in the Farr Festival woods for what has been described as a refined and premium festival of techno and disco. With Todd Terje headlining the weekend festival, this event will be a disco lover's dream. 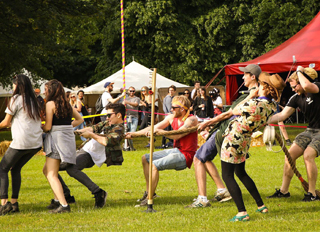 We're proud to be supporting Lambeth Country Show, London's largest family friendly festival. Boasting a unique line up that celebrates the very best of city and countryside - including music, food and crafts plus sheepdog and owl displays! To learn more about Frontier, follow us on Instagram at @FrontierLager.